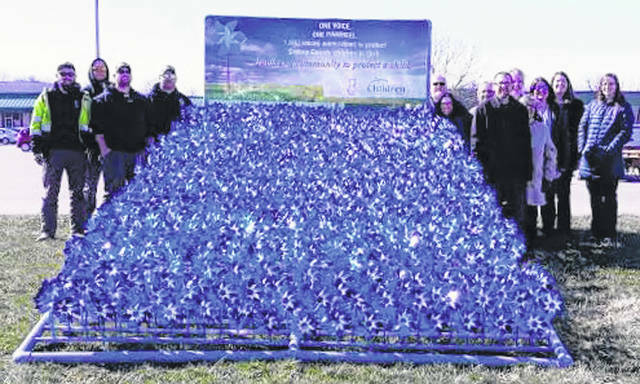 XENIA — In honor of National Child Abuse Prevention Month, Greene County Children Services is displaying 1,083 blue pinwheels in front of its offices at 601 Ledbetter Road. The accompanying banner reads “One Pinwheel. One Voice.” Each pinwheel symbolizes each voice that spoke out in concern for the safety of Greene County children in 2018. Numerous Greene County organizations are hosting their own smaller pinwheel displays, along with a “Pinwheel Partner” sign to show partnership with Children Services. Displays can be indoors or outdoors. Children Services provides pinwheels and signs to participating organizations, which include: Layh & Associates; Stephan & Associates; Recorder’s Office; NAMI; Four Oaks Early Intervention; Community Action Partnership; Visitation Center; Family & Youth Initiative; Xenia Police DARE Officer; Greene County Victim Witness; Family Violence Prevention Center; GMHA; Greene CATS; Security National Bank (Xenia); TCN Behavioral Health; Greene County Public Health; Mental Health & Recovery Board; Treasurer’s Office; Greene County Archives. Most Pinwheel Partners are also participating in Ohio Wears Blue Day by encouraging their employees and/or members to wear blue on Wednesday, April 10. Children Services is providing lapel stickers to participants and encouraging them to email photos for the agency to post on its Facebook page. Everyone is invited to participate and to e-mail photos to monica.schiffler@jfs.ohio.gov or send photos in a private message to the Greene County Children Services Facebook page. The Superhero C.A.P.E. 5K Walk/Run for Child Abuse Prevention and Elimination is the annual 5K fundraiser organized by Family Violence Prevention Center, with help from several other organizations, including Children Services. The 5K will be held Saturday, April 13.In addition to medals for the best times in various age categories, there will also be awards for the best individual and team superhero costumes. More details are available at www.runsignup.com. County organizations interested in becoming a Pinwheel Partner or participating in Wear Blue Day should contact Monica Schiffler, Public Relations Specialist with Greene County Children Services, at 937-562-6618 or monica.schiffler@jfs.ohio.gov.